Escape to the islands and get ready to discover the true meaning of paradise. While the kids enjoy an activity-packed day at our Kids Camp, parents can enjoy their very own adult playground in the heart of the tropics. Indulge in a romantic candlelight dinner, pamper yourself with body-renewing treatments at our Red Lane® Spa, sip your favourite cocktail at our swim-up bars, or just relax in chaise lounges drawn right up by the Caribbean Sea. Couples can enjoy unlimited watersports, including some of the best scuba diving in the Caribbean—located on the world's best beaches. Only Beaches offers four varietals of Robert Mondavi Wines — the oldest and most respected winery in Napa Valley—and they’re all included. At Beaches, bars are plenty, and drinks are always on the house, with premium brand liquors served around the clock. Pamper yourself with a romantic spa treatment for two that blends timeless European rituals with Caribbean scents and sensibilities. There’s plenty to do on land, from basketball and tennis, to the best golf in Jamaica for guests staying at Beaches Ocho Rios. 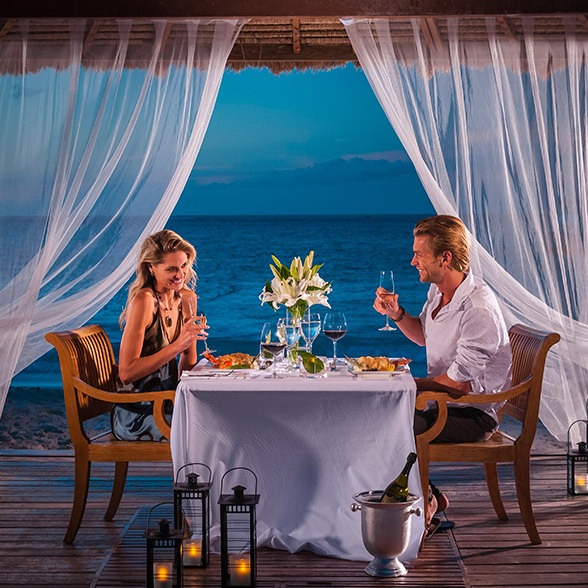 Escape to an adults-only restaurant at one of our romantic holiday resorts where the cuisine is delicious and the ambiance made for romance.